This page is a listing of "Reviewed" White Mountains Resort Condo Rentals and Time Share Exchange options from Resorts in the New Hampshire White Mountains area. These are Vacation Resorts that my Wife and I and/or our "Vacation Timeshare Exchange Friends" have used or toured on White Mountain Fall Foliage Vacations we have taken over our now over 35 years of Timeshare week exchanging and vacation resort condo rentals. We have also stayed at Time Share Vacation Resorts down in the Lake Winnipesaukee area. We did have some good Resort experiences there, but found that we were always driving north to the general areas of Lincoln, North Conway, and Bartlett to view White Mountain Attractions and "Must See's" so decided it saved a lot of driving time to just stay in the heart of the White Mountains area nearer Mount Washington and Fall Foliage Viewing Drives on the 35 mile long scenic Kancamagus Highway (#112) between Lincoln and Conway. They have an attractive clubhouse with an indoor swimming pool, hot tub, pool table, and exercise room, which is shared with their sister Resort, the Mountain View at Crown Ridge. They also have a tennis court, basketball court, and playground. There were no resort sponsored activities, but you really don't need any. I recommend you join the Timeshare Users Group - TUG ($15/Yr. ), or RedWeek.com ($14.99/Yr.) to see User Resort Reviews and ratings + more detailed info on the White Mountain Resort Listings on this page. I belong to both and find the TUG Site generally has more Resort Reviews, as well as direct links to the RCI, II, and Vacation Time Share Resort Web Site pages. The Mountain Club on Loon is a large four-season luxury resort, located just off of the west end of the scenic Kancamagus Highway which runs through the White Mountain National Forest. This White Mountains Resort is about 45 minutes west of Conway. (Conway is near the east end of the Kancamagus Hwy.) The Resort is located at the base of the Loon Mountain Ski Area on a bluff overlooking the Pemi River. Most of the resort units have great views of either the White Mountains or the river. The Mountain Club on Loon Resort has efficiency units that sleep 2 up through some "combination" 2-bedroom units that sleep up to 8. (See Resort Web Site link below for room descriptions.) Many of the units have been upgraded in recent years, ask if one you are considering has. The resort is near many area activities and is adjacent to the ski area, plus has many onsight amenities, including indoor and outdoor pools, fitness center, Sauna, Hot Tub, game room, playground, tennis and racquetball courts, nature walks, massage therapy and tanning, + a Restaurant & Lounge. All guest receive a complimentary day membership to a Spa and Health Club located in the hotel. 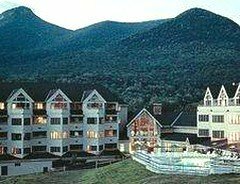 If you like a large resort with a lot of on-site amenities to choose from, The Mountain Club on Loon is a Top Pick White Mountains Resort in the Lincoln, New Hampshire area. It is important that you get in The "Suites" at Eastern Slope Inn Vs the original old "Eastern Slope Inn" on the same approximately 40 acre grounds. The resort is located on the edge of the town of North Conaway. On-site amenities include a glass-enclosed swimming pool, Jacuzzi, tennis courts, and game room -- all shared with the original Eastern Slope Inn. There is a nearby Lake with fishing, + Golf, and Skiing. The Resort is very handy to all of the activities in and near North Conway, NH. And you can leave your car parked at the Resort and walk to nearby restaurants. Most "suite" units have a partial kitchen with a Microwave/Convection Oven combination. Ask about the view and size of the unit you are considering since there are differences. Another White Mountains Resort Top Pick . Tip - Generally is always good to ask if the specific Unit you are considering has been recently rennovated and what the view is. Higher floors are generally better for the view and less noise. Might also ask if there are elevators. If summer months, ask about air conditioning in unit. Read candid user reviews and see 21 Lincoln, New Hampshire area Resorts, Inns, and Hotels ranked by popularity with comparison pricing and pictures at: Compare prices and read what other travelers have to say at TripAdvisor for Lincoln, New Hampshire. To Forest Glen Inn Listing & Pictures at RCI - No Forest Glen Inn Resort Web Site we could find as of 9/4/07. Read candid user reviews and see 20 North Conway, New Hampshire area Resorts, Inns, and Hotels ranked by popularity with comparison pricing and pictures at: Compare prices and read what other travelers have to say about Hotels and Resorts in North Conway, New Hampshire. Thanks for dropping by -- come back and visit us soon for Info on your next White Mountains Resort Lodging questions. Please send us any Comments or Suggestions you might have for this White Mountains Resort Page or New England Mountain Fall Foliage Vacations Site to us on our Comments, Suggestion, & Favorites Form -- particularly if you have had any good or bad Vacation Lodging experiences with any of the White Mountains Resort Listings above. If you have any personal White Mountains Resort or New Hampshire Scenic or Attraction Pictures you would like to share, please send them using our Comment Form above -- we always appreciate colorful mountain fall foliage photos and scenic mountain vacation pictures. To Mountain Fall Foliage Vacations Home Page - Affordable New England Fall Foliage Vacations - Including Pennsylvania Pocono Mountain Vacations, New Hampshire Attraction "Reviews," and New Hampshire Fall Foliage Vacations. To Top of this page - White Mountains Resort Top Picks in North Conway & Lincoln, New Hampshire areas. + Vacation Timeshare Condo Rental Resort Amenities and nearby Attractions. + Some Getaway NH Ski Vacation Resorts.